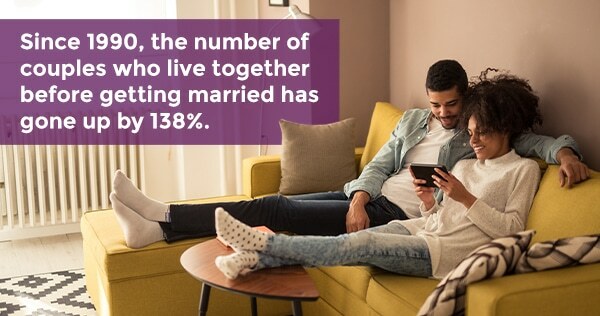 More and more people are living together with a partner before getting married. Since 1990, the number of couples who do this has gone up by 138%. There are a number of things you can do to keep your relationship strong, before and after marriage. Following are eight tips that are sure to help you and your partner improve your relationship. That may seem like it is not at all related to keeping a relationship in good shape, but according to new research, people who eat better food are happier and healthier in terms of their mental well-being. People who eat better are happier, have more energy, get better sleep, and are in a better position to have healthier relationships. If your commitment is not just to your relationship, but to your health as well, you can have a healthier relationship. Your commitment to your health should go beyond what you put in your body and should extend to what you do with your body. This is not about weight loss or gain but about both of you being the healthiest you can be. Healthy people form healthier relationships. Exercising together, such as taking work-out classes or playing tennis, can strengthen your relationship. Getting and staying healthy can have some of the same benefits as couples counseling. Everyone brings baggage from past relationships. If you need to go to therapy to let go of that baggage from your other relationships, you should do that. This can be very good to help you work through relationship problems. It is unfair to you and to your partner to keep bringing issues up that are from past relationships. It can be hard to let go of these issues you have in your heart, but it is possible. Your friends are an important part of your life, and the same can be said of your partner’s relationship with their friends. Getting to know and be close to the people who matter to your partner will help your relationship get and stay stronger. You need to have special time to do things with your partner, and you need to do the same with your friends. Friends add a lot to our lives, losing touch with them can make us bitter, and that will do nothing to help your relationship. Both of you need time to spend with the other people in your life who matter to you. In the same way you want to get to know your partner’s friends, it is also important to get to know their family. Both of your families are important to you, and as you become a larger family, being on good terms with your partner’s family also shows your commitment to the relationship. This can be a very challenging thing to accomplish, but there are small things you can do when you fight–and you will fight on occasion–to make it better. Using words such as “should,” “never,” and “always” is not helpful to any relationship. These words are usually part of statements that are irrational and do not lead to constructive communication with your partner. You can use your fights as ways to become more effective in your communication, or you can allow these episodes to destroy your relationship. If you say you are going to do something, or you are asked by them to do something, you should make it a priority. Doing so shows them that you care, that you have a commitment to the relationship, and that their needs are important to you. Do not dawdle when it comes to doing things for your partner. There are a lot of things you can do to show your commitment to your partner and to the relationship. Not all efforts to keep a relationship strong and healthy look the same. Following these tips can be a start, but if you feel like you need additional, outside help contact Keri Powell Therapy to learn more about couples counseling. Previous post: Burnout: When Do I Need Professional Help?